If you have a child at Mercy Secondary School you can have yourownpersonal view of the full calendar of events, activities andschoolnews. No more out-of-date paper calendars, searchingthroughletters from the school or browsing the website – everythingyouneed to know, when you need it, at your fingertips! Key featuresofthe current version: - View the school calendar and make itmorerelevant to you by using the calendar filters and save them toyourcalendar - View the school news - Receive important messagesHow toUse the App At the bottom of the screen there are five tabs:Home:See a summary of the latest news and today’s news. You canclick onthe event it will take you to the full event details. Thelatestfive news items can be scrolled through to view theheadlines, youcan click on the headline to view the full newsstory. CalendarThis can be viewed in two ways; as Month To View orList View. Youcan switch between these views using the icons innavigation bar atthe top of the page. On the centre left is a smallcalendar iconand on the right is a small list icon. When using theMonth To Viewand one of the dates is marked by a dot, thisindicates that thereis an event on that day. If you tap on thatdate, you will see theevent appear below the calendar. Tap anyevent to see more detailedinformation and a map of the eventlocation (if applicable). In theList View, you can scroll throughall this months events, in dateorder. Again, you can tap any eventto see more detailedinformation and a map of the event location (ifapplicable). Youcan even import an event into your personalcalendar from your app,if you select the import icon. Please notethat if an event isaltered in this calendar it will not change thedetails in yourpersonal calendar unless you re-import the data.Messages Shows youall the messages for your school or organisation.Also within thissection you can assign yourself to personalisedmessage groups,simply click on message groups to activate anddeactivate whichmessages you would like to see. News Shows all thelatest storiesfrom your school or organisation. If you tap on anynews item youwill be able to see more detail. Information: In thistab you canview the schools documentation (if applicable) such asthereprospectus, news letters and links to further website links tomoreinformation. You can also share the app via email and socialmediaCalendar Filters: Clicking on calendar filters, this gives youtheopportunity to only see those calendar items that are relevanttoyou by selecting the Departments and Activities the appwilldisplay. ---- Mercy Secondary School is for Android version 4.3andabove. Copyright © Apps Central Ltd. All rights reserved.Thedesign of this Android application is fully protected bycopyrightand may not be reproduced without permission. If you have a child at Albyn School you canhave your own personal view of the full calendar of events,activities and school news.No more out-of-date paper calendars, searching through letters fromthe school or browsing the website – everything you need to know,when you need it, at your fingertips!Key features of the current version:- View the school calendar and make it more relevant to you byusing the calendar filters and save them to your calendar- View the school news- Receive important messagesHow to Use the AppAt the bottom of the screen there are five tabs:Home:See a summary of the latest news and today’s news. You can clickon the event it will take you to the full event details. The latestfive news items can be scrolled through to view the headlines, youcan click on the headline to view the full news story.CalendarThis can be viewed in two ways; as Month To View or List View.You can switch between these views using the icons in navigationbar at the top of the page. On the centre left is a small calendaricon and on the right is a small list icon.When using the Month To View and one of the dates is marked by adot, this indicates that there is an event on that day. If you tapon that date, you will see the event appear below the calendar. Tapany event to see more detailed information and a map of the eventlocation (if applicable).In the List View, you can scroll through all this months events, indate order. Again, you can tap any event to see more detailedinformation and a map of the event location (if applicable).You can even import an event into your personal calendar from yourapp, if you select the import icon. Please note that if an event isaltered in this calendar it will not change the details in yourpersonal calendar unless you re-import the data.MessagesShows you all the messages for your school or organisation. Alsowithin this section you can assign yourself to personalised messagegroups, simply click on message groups to activate and deactivatewhich messages you would like to see.NewsShows all the latest stories from your school or organisation. Ifyou tap on any news item you will be able to see more detail.Information:In this tab you can view the schools documentation (ifapplicable) such as there prospectus, news letters and links tofurther website links to more information. You can also share theapp via email and social mediaCalendar Filters:Clicking on calendar filters, this gives you the opportunity toonly see those calendar items that are relevant to you by selectingthe Departments and Activities the app will display.----Albyn School is for Android version 4.3 and above.Copyright © Apps Central Ltd. All rights reserved. The design ofthis Android application is fully protected by copyright and maynot be reproduced without permission. If you have a child at Clyde Valley High School you can have yourown personal view of the full calendar of events, activities andschool news. No more out-of-date paper calendars, searching throughletters from the school or browsing the website – everything youneed to know, when you need it, at your fingertips! Key features ofthe current version: - View the school calendar and make it morerelevant to you by using the calendar filters and save them to yourcalendar - View the school news - Receive important messages How toUse the App At the bottom of the screen there are five tabs: Home:See a summary of the latest news and today’s news. You can click onthe event it will take you to the full event details. The latestfive news items can be scrolled through to view the headlines, youcan click on the headline to view the full news story. CalendarThis can be viewed in two ways; as Month To View or List View. Youcan switch between these views using the icons in navigation bar atthe top of the page. On the centre left is a small calendar iconand on the right is a small list icon. When using the Month To Viewand one of the dates is marked by a dot, this indicates that thereis an event on that day. If you tap on that date, you will see theevent appear below the calendar. Tap any event to see more detailedinformation and a map of the event location (if applicable). In theList View, you can scroll through all this months events, in dateorder. Again, you can tap any event to see more detailedinformation and a map of the event location (if applicable). Youcan even import an event into your personal calendar from your app,if you select the import icon. Please note that if an event isaltered in this calendar it will not change the details in yourpersonal calendar unless you re-import the data. Messages Shows youall the messages for your school or organisation. Also within thissection you can assign yourself to personalised message groups,simply click on message groups to activate and deactivate whichmessages you would like to see. News Shows all the latest storiesfrom your school or organisation. If you tap on any news item youwill be able to see more detail. Information: In this tab you canview the schools documentation (if applicable) such as thereprospectus, news letters and links to further website links to moreinformation. You can also share the app via email and social mediaCalendar Filters: Clicking on calendar filters, this gives you theopportunity to only see those calendar items that are relevant toyou by selecting the Departments and Activities the app willdisplay. ---- Clyde Valley High School is for Android version 4.3and above. Copyright © Apps Central Ltd. All rights reserved. Thedesign of this Android application is fully protected by copyrightand may not be reproduced without permission. If you have a child at Woodhouse Academy youcan have your own personal view of the full calendar of events,activities and school news.No more out-of-date paper calendars, searching through letters fromthe school or browsing the website – everything you need to know,when you need it, at your fingertips!Key features of the current version:- View the school calendar and make it more relevant to you byusing the calendar filters and save them to your calendar- View the school news- Receive important messagesHow to Use the AppAt the bottom of the screen there are five tabs:Home:See a summary of the latest news and today’s news. You can clickon the event it will take you to the full event details. The latestfive news items can be scrolled through to view the headlines, youcan click on the headline to view the full news story.CalendarThis can be viewed in two ways; as Month To View or List View.You can switch between these views using the icons in navigationbar at the top of the page. On the centre left is a small calendaricon and on the right is a small list icon.When using the Month To View and one of the dates is marked by adot, this indicates that there is an event on that day. If you tapon that date, you will see the event appear below the calendar. Tapany event to see more detailed information and a map of the eventlocation (if applicable).In the List View, you can scroll through all this months events, indate order. Again, you can tap any event to see more detailedinformation and a map of the event location (if applicable).You can even import an event into your personal calendar from yourapp, if you select the import icon. Please note that if an event isaltered in this calendar it will not change the details in yourpersonal calendar unless you re-import the data.MessagesShows you all the messages for your school or organisation. Alsowithin this section you can assign yourself to personalised messagegroups, simply click on message groups to activate and deactivatewhich messages you would like to see.NewsShows all the latest stories from your school or organisation. Ifyou tap on any news item you will be able to see more detail.Information:In this tab you can view the schools documentation (ifapplicable) such as there prospectus, news letters and links tofurther website links to more information. 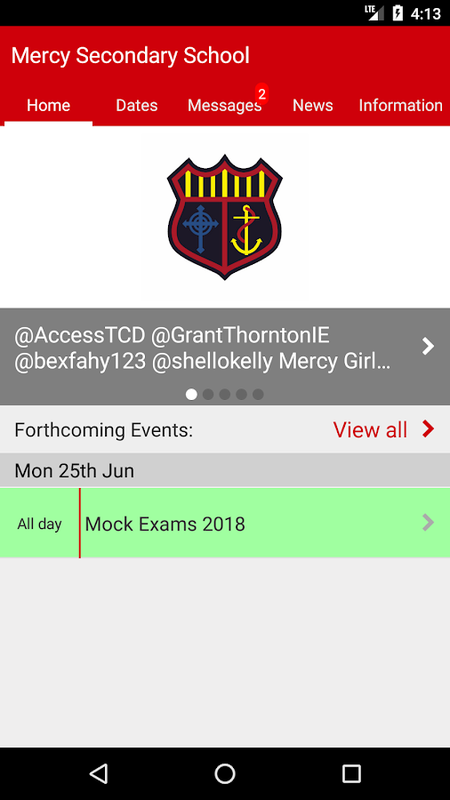 You can also share theapp via email and social mediaCalendar Filters:Clicking on calendar filters, this gives you the opportunity toonly see those calendar items that are relevant to you by selectingthe Departments and Activities the app will display.----Woodhouse Academy is for Android version 4.3 and above.Copyright © Apps Central Ltd. All rights reserved. The design ofthis Android application is fully protected by copyright and maynot be reproduced without permission. If you have a child at Pendle Vale College youcan have your own personal view of the full calendar of events,activities and school news.No more out-of-date paper calendars, searching through lettersfrom the school or browsing the website – everything you need toknow, when you need it, at your fingertips!Key features of the current version:- View the school calendar and make it more relevant to you byusing the calendar filters and save them to your calendar- View the school news- Receive important messagesHow to Use the AppAt the bottom of the screen there are five tabs:Home:See a summary of the latest news and today’s news. You can clickon an event and it will take you to the full event details. Thelatest five news items can be scrolled through to view theheadlines, you can click on the headline to view the full newsstory.CalendarThis can be viewed in two ways; as Month To View or List View.You can switch between these views using the icons in navigationbar at the top of the page. On the centre left is a small calendaricon and on the right is a small list icon.When using the Month To View and one of the dates is marked by adot, this indicates that there is an event on that day. If you tapon that date, you will see the event appear below the calendar. Tapany event to see more detailed information and a map of the eventlocation (if applicable).In the List View, you can scroll through all this months events,in date order. Again, you can tap any event to see more detailedinformation and a map of the event location (if applicable).You can even import an event into your personal calendar fromyour app, if you select the import icon. Please note that if anevent is altered in this calendar it will not change the details inyour personal calendar unless you re-import the data.MessagesThis shows you all the messages for the school. Also within thissection you can assign yourself to personalised message groups,simply click on message groups to activate and deactivate whichmessages you would like to see.NewsThis shows all the latest stories from the school. If you tap onany news item you will be able to see more detail.Information:In this tab you can view the schools documentation (ifapplicable) such as there prospectus, news letters and links tofurther website links to more information. You can also share theapp via email and social mediaCalendar Filters:Clicking on calendar filters, this gives you the opportunity toonly see those calendar items that are relevant to you by selectingthe Departments and Activities the app will display.----Pendle Vale College is for Android version 4.3 and above.Copyright © Apps Central Ltd. All rights reserved. The design ofthis Android application is fully protected by copyright and maynot be reproduced without permission. If you have a child at Rush Green PrimarySchool you can have your own personal view of the full calendar ofevents, activities and school news.No more out-of-date paper calendars, searching through letters fromthe school or browsing the website – everything you need to know,when you need it, at your fingertips!Key features of the current version:- View the school calendar and make it more relevant to you byusing the calendar filters and save them to your calendar- View the school news- Receive important messagesHow to Use the AppAt the bottom of the screen there are five tabs:Home:See a summary of the latest news and today’s news. You can clickon the event it will take you to the full event details. The latestfive news items can be scrolled through to view the headlines, youcan click on the headline to view the full news story.CalendarThis can be viewed in two ways; as Month To View or List View.You can switch between these views using the icons in navigationbar at the top of the page. On the centre left is a small calendaricon and on the right is a small list icon.When using the Month To View and one of the dates is marked by adot, this indicates that there is an event on that day. If you tapon that date, you will see the event appear below the calendar. Tapany event to see more detailed information and a map of the eventlocation (if applicable).In the List View, you can scroll through all this months events, indate order. Again, you can tap any event to see more detailedinformation and a map of the event location (if applicable).You can even import an event into your personal calendar from yourapp, if you select the import icon. Please note that if an event isaltered in this calendar it will not change the details in yourpersonal calendar unless you re-import the data.MessagesShows you all the messages for your school or organisation. Alsowithin this section you can assign yourself to personalised messagegroups, simply click on message groups to activate and deactivatewhich messages you would like to see.NewsShows all the latest stories from your school or organisation. Ifyou tap on any news item you will be able to see more detail.Information:In this tab you can view the schools documentation (ifapplicable) such as there prospectus, news letters and links tofurther website links to more information. You can also share theapp via email and social mediaCalendar Filters:Clicking on calendar filters, this gives you the opportunity toonly see those calendar items that are relevant to you by selectingthe Departments and Activities the app will display.----Rush Green Primary School is for Android version 4.3 and above.Copyright © Apps Central Ltd. All rights reserved. The design ofthis Android application is fully protected by copyright and maynot be reproduced without permission. If you have a child at The RegentsInternational School you can have your own personal view of thefull calendar of events, activities and school news.No more out-of-date paper calendars, searching through letters fromthe school or browsing the website – everything you need to know,when you need it, at your fingertips!Key features of the current version:- View the school calendar and make it more relevant to you byusing the calendar filters and save them to your calendar- View the school news- Receive important messagesHow to Use the AppAt the bottom of the screen there are five tabs:Home:See a summary of the latest news and today’s news. You can clickon the event it will take you to the full event details. The latestfive news items can be scrolled through to view the headlines, youcan click on the headline to view the full news story.CalendarThis can be viewed in two ways; as Month To View or List View.You can switch between these views using the icons in navigationbar at the top of the page. On the centre left is a small calendaricon and on the right is a small list icon.When using the Month To View and one of the dates is marked by adot, this indicates that there is an event on that day. If you tapon that date, you will see the event appear below the calendar. Tapany event to see more detailed information and a map of the eventlocation (if applicable).In the List View, you can scroll through all this months events, indate order. Again, you can tap any event to see more detailedinformation and a map of the event location (if applicable).You can even import an event into your personal calendar from yourapp, if you select the import icon. Please note that if an event isaltered in this calendar it will not change the details in yourpersonal calendar unless you re-import the data.MessagesShows you all the messages for your school or organisation. Alsowithin this section you can assign yourself to personalised messagegroups, simply click on message groups to activate and deactivatewhich messages you would like to see.NewsShows all the latest stories from your school or organisation. Ifyou tap on any news item you will be able to see more detail.Information:In this tab you can view the schools documentation (ifapplicable) such as there prospectus, news letters and links tofurther website links to more information. You can also share theapp via email and social mediaCalendar Filters:Clicking on calendar filters, this gives you the opportunity toonly see those calendar items that are relevant to you by selectingthe Departments and Activities the app will display.----The Regents International School is for Android version 4.3 andabove.Copyright © Apps Central Ltd. All rights reserved. The design ofthis Android application is fully protected by copyright and maynot be reproduced without permission. If you have a child at Gascoigne Primary School you can have yourown personal view of the full calendar of events, activities andschool news.No more out-of-date paper calendars, searching throughletters from the school or browsing the website – everything youneed to know, when you need it, at your fingertips! Key features ofthe current version: - View the school calendar and make it morerelevant to you by using the calendar filters and save them to yourcalendar- View the school news- Receive important messages How toUse the App At the bottom of the screen there are fivetabs:Home:See a summary of the latest news and today’s news. Youcan click on the event it will take you to the full event details.The latest five news items can be scrolled through to view theheadlines, you can click on the headline to view the full newsstory. Calendar This can be viewed in two ways; as Month To View orList View. You can switch between these views using the icons innavigation bar at the top of the page. On the centre left is asmall calendar icon and on the right is a small list icon.Whenusing the Month To View and one of the dates is marked by a dot,this indicates that there is an event on that day. If you tap onthat date, you will see the event appear below the calendar. Tapany event to see more detailed information and a map of the eventlocation (if applicable).In the List View, you can scroll throughall this months events, in date order. Again, you can tap any eventto see more detailed information and a map of the event location(if applicable).You can even import an event into your personalcalendar from your app, if you select the import icon. Please notethat if an event is altered in this calendar it will not change thedetails in your personal calendar unless you re-import thedata.MessagesShows you all the messages for your school ororganisation. Also within this section you can assign yourself topersonalised message groups, simply click on message groups toactivate and deactivate which messages you would like to see. NewsShows all the latest stories from your school or organisation. Ifyou tap on any news item you will be able to see moredetail.Information:In this tab you can view the schoolsdocumentation (if applicable) such as there prospectus, newsletters and links to further website links to more information. Youcan also share the app via email and social mediaCalendarFilters:Clicking on calendar filters, this gives you theopportunity to only see those calendar items that are relevant toyou by selecting the Departments and Activities the app willdisplay.----Gascoigne Primary School is for Android version 4.3 andabove.Copyright © Apps Central Ltd. All rights reserved. The designof this Android application is fully protected by copyright and maynot be reproduced without permission. If you have a child at St David's High School you can have your ownpersonal view of the full calendar of events, activities and schoolnews. No more out-of-date paper calendars, searching throughletters from the school or browsing the website – everything youneed to know, when you need it, at your fingertips! Key features ofthe current version: - View the school calendar and make it morerelevant to you by using the calendar filters and save them to yourcalendar - View the school news - Receive important messages How toUse the App At the bottom of the screen there are five tabs: Home:See a summary of the latest news and today’s news. You can click onthe event it will take you to the full event details. The latestfive news items can be scrolled through to view the headlines, youcan click on the headline to view the full news story. CalendarThis can be viewed in two ways; as Month To View or List View. Youcan switch between these views using the icons in navigation bar atthe top of the page. On the centre left is a small calendar iconand on the right is a small list icon. When using the Month To Viewand one of the dates is marked by a dot, this indicates that thereis an event on that day. If you tap on that date, you will see theevent appear below the calendar. Tap any event to see more detailedinformation and a map of the event location (if applicable). In theList View, you can scroll through all this months events, in dateorder. Again, you can tap any event to see more detailedinformation and a map of the event location (if applicable). Youcan even import an event into your personal calendar from your app,if you select the import icon. Please note that if an event isaltered in this calendar it will not change the details in yourpersonal calendar unless you re-import the data. Messages Shows youall the messages for your school or organisation. Also within thissection you can assign yourself to personalised message groups,simply click on message groups to activate and deactivate whichmessages you would like to see. News Shows all the latest storiesfrom your school or organisation. If you tap on any news item youwill be able to see more detail. Information: In this tab you canview the schools documentation (if applicable) such as thereprospectus, news letters and links to further website links to moreinformation. You can also share the app via email and social mediaCalendar Filters: Clicking on calendar filters, this gives you theopportunity to only see those calendar items that are relevant toyou by selecting the Departments and Activities the app willdisplay. ---- St David's High School is for Android version 4.3 andabove. Copyright © Apps Central Ltd. All rights reserved. Thedesign of this Android application is fully protected by copyrightand may not be reproduced without permission. If you have a child at Falkirk High School you can have your ownpersonal view of the full calendar of events, activities and schoolnews. No more out-of-date paper calendars, searching throughletters from the school or browsing the website – everything youneed to know, when you need it, at your fingertips! Key features ofthe current version: - View the school calendar and make it morerelevant to you by using the calendar filters and save them to yourcalendar - View the school news - Receive important messages How toUse the App At the bottom of the screen there are five tabs: Home:See a summary of the latest news and today’s news. You can click onthe event it will take you to the full event details. The latestfive news items can be scrolled through to view the headlines, youcan click on the headline to view the full news story. CalendarThis can be viewed in two ways; as Month To View or List View. Youcan switch between these views using the icons in navigation bar atthe top of the page. On the centre left is a small calendar iconand on the right is a small list icon. When using the Month To Viewand one of the dates is marked by a dot, this indicates that thereis an event on that day. If you tap on that date, you will see theevent appear below the calendar. Tap any event to see more detailedinformation and a map of the event location (if applicable). In theList View, you can scroll through all this months events, in dateorder. Again, you can tap any event to see more detailedinformation and a map of the event location (if applicable). Youcan even import an event into your personal calendar from your app,if you select the import icon. Please note that if an event isaltered in this calendar it will not change the details in yourpersonal calendar unless you re-import the data. Messages Shows youall the messages for your school or organisation. Also within thissection you can assign yourself to personalised message groups,simply click on message groups to activate and deactivate whichmessages you would like to see. News Shows all the latest storiesfrom your school or organisation. If you tap on any news item youwill be able to see more detail. Information: In this tab you canview the schools documentation (if applicable) such as thereprospectus, news letters and links to further website links to moreinformation. You can also share the app via email and social mediaCalendar Filters: Clicking on calendar filters, this gives you theopportunity to only see those calendar items that are relevant toyou by selecting the Departments and Activities the app willdisplay. ---- Falkirk High School is for Android version 4.3 andabove. Copyright © Apps Central Ltd. All rights reserved. Thedesign of this Android application is fully protected by copyrightand may not be reproduced without permission. If you have a child at Broxburn Academy you can have your ownpersonal view of the full calendar of events, activities and schoolnews. No more out-of-date paper calendars, searching throughletters from the school or browsing the website – everything youneed to know, when you need it, at your fingertips! Key features ofthe current version: - View the school calendar and make it morerelevant to you by using the calendar filters and save them to yourcalendar - View the school news - Receive important messages How toUse the App At the bottom of the screen there are five tabs: Home:See a summary of the latest news and today’s news. You can click onthe event it will take you to the full event details. The latestfive news items can be scrolled through to view the headlines, youcan click on the headline to view the full news story. CalendarThis can be viewed in two ways; as Month To View or List View. Youcan switch between these views using the icons in navigation bar atthe top of the page. On the centre left is a small calendar iconand on the right is a small list icon. When using the Month To Viewand one of the dates is marked by a dot, this indicates that thereis an event on that day. If you tap on that date, you will see theevent appear below the calendar. Tap any event to see more detailedinformation and a map of the event location (if applicable). In theList View, you can scroll through all this months events, in dateorder. Again, you can tap any event to see more detailedinformation and a map of the event location (if applicable). Youcan even import an event into your personal calendar from your app,if you select the import icon. Please note that if an event isaltered in this calendar it will not change the details in yourpersonal calendar unless you re-import the data. Messages Shows youall the messages for your school or organisation. Also within thissection you can assign yourself to personalised message groups,simply click on message groups to activate and deactivate whichmessages you would like to see. News Shows all the latest storiesfrom your school or organisation. If you tap on any news item youwill be able to see more detail. Information: In this tab you canview the schools documentation (if applicable) such as thereprospectus, news letters and links to further website links to moreinformation. You can also share the app via email and social mediaCalendar Filters: Clicking on calendar filters, this gives you theopportunity to only see those calendar items that are relevant toyou by selecting the Departments and Activities the app willdisplay. ---- Broxburn Academy is for Android version 4.3 andabove. Copyright © Apps Central Ltd. All rights reserved. Thedesign of this Android application is fully protected by copyrightand may not be reproduced without permission. If you have a child at Braes High School you can have your ownpersonal view of the full calendar of events, activities and schoolnews.No more out-of-date paper calendars, searching through lettersfrom the school or browsing the website – everything you need toknow, when you need it, at your fingertips! Key features of thecurrent version: - View the school calendar and make it morerelevant to you by using the calendar filters and save them to yourcalendar- View the school news- Receive important messages How toUse the App At the bottom of the screen there are fivetabs:Home:See a summary of the latest news and today’s news. Youcan click on the event it will take you to the full event details.The latest five news items can be scrolled through to view theheadlines, you can click on the headline to view the full newsstory. Calendar This can be viewed in two ways; as Month To View orList View. You can switch between these views using the icons innavigation bar at the top of the page. On the centre left is asmall calendar icon and on the right is a small list icon.Whenusing the Month To View and one of the dates is marked by a dot,this indicates that there is an event on that day. If you tap onthat date, you will see the event appear below the calendar. Tapany event to see more detailed information and a map of the eventlocation (if applicable).In the List View, you can scroll throughall this months events, in date order. Again, you can tap any eventto see more detailed information and a map of the event location(if applicable).You can even import an event into your personalcalendar from your app, if you select the import icon. Please notethat if an event is altered in this calendar it will not change thedetails in your personal calendar unless you re-import thedata.MessagesShows you all the messages for your school ororganisation. Also within this section you can assign yourself topersonalised message groups, simply click on message groups toactivate and deactivate which messages you would like to see. NewsShows all the latest stories from your school or organisation. Ifyou tap on any news item you will be able to see moredetail.Information:In this tab you can view the schoolsdocumentation (if applicable) such as there prospectus, newsletters and links to further website links to more information. Youcan also share the app via email and social mediaCalendarFilters:Clicking on calendar filters, this gives you theopportunity to only see those calendar items that are relevant toyou by selecting the Departments and Activities the app willdisplay.----Braes High School is for Android version 4.3 andabove.Copyright © Apps Central Ltd. All rights reserved. The designof this Android application is fully protected by copyright and maynot be reproduced without permission. If you have a child at Larbert High School you can have your ownpersonal view of the full calendar of events, activities and schoolnews. No more out-of-date paper calendars, searching throughletters from the school or browsing the website – everything youneed to know, when you need it, at your fingertips! Key features ofthe current version: - View the school calendar and make it morerelevant to you by using the calendar filters and save them to yourcalendar - View the school news - Receive important messages How toUse the App At the bottom of the screen there are five tabs: Home:See a summary of the latest news and today’s news. You can click onthe event it will take you to the full event details. The latestfive news items can be scrolled through to view the headlines, youcan click on the headline to view the full news story. CalendarThis can be viewed in two ways; as Month To View or List View. Youcan switch between these views using the icons in navigation bar atthe top of the page. On the centre left is a small calendar iconand on the right is a small list icon. When using the Month To Viewand one of the dates is marked by a dot, this indicates that thereis an event on that day. If you tap on that date, you will see theevent appear below the calendar. Tap any event to see more detailedinformation and a map of the event location (if applicable). In theList View, you can scroll through all this months events, in dateorder. Again, you can tap any event to see more detailedinformation and a map of the event location (if applicable). Youcan even import an event into your personal calendar from your app,if you select the import icon. Please note that if an event isaltered in this calendar it will not change the details in yourpersonal calendar unless you re-import the data. Messages Shows youall the messages for your school or organisation. Also within thissection you can assign yourself to personalised message groups,simply click on message groups to activate and deactivate whichmessages you would like to see. News Shows all the latest storiesfrom your school or organisation. If you tap on any news item youwill be able to see more detail. Information: In this tab you canview the schools documentation (if applicable) such as thereprospectus, news letters and links to further website links to moreinformation. You can also share the app via email and social mediaCalendar Filters: Clicking on calendar filters, this gives you theopportunity to only see those calendar items that are relevant toyou by selecting the Departments and Activities the app willdisplay. ---- Larbert High School is for Android version 4.3 andabove. Copyright © Apps Central Ltd. All rights reserved. Thedesign of this Android application is fully protected by copyrightand may not be reproduced without permission. If you have a child at Lingfield Primary School you can have yourown personal view of the full calendar of events, activities andschool news. No more out-of-date paper calendars, searching throughletters from the school or browsing the website – everything youneed to know, when you need it, at your fingertips! Key features ofthe current version: - View the school calendar and make it morerelevant to you by using the calendar filters and save them to yourcalendar - View the school news - Receive important messages How toUse the App At the bottom of the screen there are five tabs: Home:See a summary of the latest news and today’s news. You can click onthe event it will take you to the full event details. The latestfive news items can be scrolled through to view the headlines, youcan click on the headline to view the full news story. CalendarThis can be viewed in two ways; as Month To View or List View. Youcan switch between these views using the icons in navigation bar atthe top of the page. On the centre left is a small calendar iconand on the right is a small list icon. When using the Month To Viewand one of the dates is marked by a dot, this indicates that thereis an event on that day. If you tap on that date, you will see theevent appear below the calendar. Tap any event to see more detailedinformation and a map of the event location (if applicable). In theList View, you can scroll through all this months events, in dateorder. Again, you can tap any event to see more detailedinformation and a map of the event location (if applicable). Youcan even import an event into your personal calendar from your app,if you select the import icon. Please note that if an event isaltered in this calendar it will not change the details in yourpersonal calendar unless you re-import the data. Messages Shows youall the messages for your school or organisation. Also within thissection you can assign yourself to personalised message groups,simply click on message groups to activate and deactivate whichmessages you would like to see. News Shows all the latest storiesfrom your school or organisation. If you tap on any news item youwill be able to see more detail. Information: In this tab you canview the schools documentation (if applicable) such as thereprospectus, news letters and links to further website links to moreinformation. You can also share the app via email and social mediaCalendar Filters: Clicking on calendar filters, this gives you theopportunity to only see those calendar items that are relevant toyou by selecting the Departments and Activities the app willdisplay. ---- Lingfield Primary School is for Android version 4.3and above. Copyright © Apps Central Ltd. All rights reserved. Thedesign of this Android application is fully protected by copyrightand may not be reproduced without permission. If you have a child at Carronshore Primary School you can have yourown personal view of the full calendar of events, activities andschool news.No more out-of-date paper calendars, searching throughletters from the school or browsing the website – everything youneed to know, when you need it, at your fingertips! Key features ofthe current version: - View the school calendar and make it morerelevant to you by using the calendar filters and save them to yourcalendar- View the school news- Receive important messages How toUse the App At the bottom of the screen there are fivetabs:Home:See a summary of the latest news and today’s news. Youcan click on the event it will take you to the full event details.The latest five news items can be scrolled through to view theheadlines, you can click on the headline to view the full newsstory. Calendar This can be viewed in two ways; as Month To View orList View. You can switch between these views using the icons innavigation bar at the top of the page. On the centre left is asmall calendar icon and on the right is a small list icon.Whenusing the Month To View and one of the dates is marked by a dot,this indicates that there is an event on that day. If you tap onthat date, you will see the event appear below the calendar. Tapany event to see more detailed information and a map of the eventlocation (if applicable).In the List View, you can scroll throughall this months events, in date order. Again, you can tap any eventto see more detailed information and a map of the event location(if applicable).You can even import an event into your personalcalendar from your app, if you select the import icon. Please notethat if an event is altered in this calendar it will not change thedetails in your personal calendar unless you re-import thedata.MessagesShows you all the messages for your school ororganisation. Also within this section you can assign yourself topersonalised message groups, simply click on message groups toactivate and deactivate which messages you would like to see. NewsShows all the latest stories from your school or organisation. Ifyou tap on any news item you will be able to see moredetail.Information:In this tab you can view the schoolsdocumentation (if applicable) such as there prospectus, newsletters and links to further website links to more information. Youcan also share the app via email and social mediaCalendarFilters:Clicking on calendar filters, this gives you theopportunity to only see those calendar items that are relevant toyou by selecting the Departments and Activities the app willdisplay.----Carronshore Primary School is for Android version 4.3and above.Copyright © Apps Central Ltd. All rights reserved. Thedesign of this Android application is fully protected by copyrightand may not be reproduced without permission. If you have a child at Bannockburn Primary School you can have yourown personal view of the full calendar of events, activities andschool news. No more out-of-date paper calendars, searching throughletters from the school or browsing the website – everything youneed to know, when you need it, at your fingertips! Key features ofthe current version: - View the school calendar and make it morerelevant to you by using the calendar filters and save them to yourcalendar - View the school news - Receive important messages How toUse the App At the bottom of the screen there are five tabs: Home:See a summary of the latest news and today’s news. You can click onthe event it will take you to the full event details. The latestfive news items can be scrolled through to view the headlines, youcan click on the headline to view the full news story. CalendarThis can be viewed in two ways; as Month To View or List View. Youcan switch between these views using the icons in navigation bar atthe top of the page. On the centre left is a small calendar iconand on the right is a small list icon. When using the Month To Viewand one of the dates is marked by a dot, this indicates that thereis an event on that day. If you tap on that date, you will see theevent appear below the calendar. Tap any event to see more detailedinformation and a map of the event location (if applicable). In theList View, you can scroll through all this months events, in dateorder. Again, you can tap any event to see more detailedinformation and a map of the event location (if applicable). Youcan even import an event into your personal calendar from your app,if you select the import icon. Please note that if an event isaltered in this calendar it will not change the details in yourpersonal calendar unless you re-import the data. Messages Shows youall the messages for your school or organisation. Also within thissection you can assign yourself to personalised message groups,simply click on message groups to activate and deactivate whichmessages you would like to see. News Shows all the latest storiesfrom your school or organisation. If you tap on any news item youwill be able to see more detail. Information: In this tab you canview the schools documentation (if applicable) such as thereprospectus, news letters and links to further website links to moreinformation. You can also share the app via email and social mediaCalendar Filters: Clicking on calendar filters, this gives you theopportunity to only see those calendar items that are relevant toyou by selecting the Departments and Activities the app willdisplay. ---- Bannockburn Primary School is for Android version 4.3and above. Copyright © Apps Central Ltd. All rights reserved. Thedesign of this Android application is fully protected by copyrightand may not be reproduced without permission. If you have a child at SSA you can have your own personal view ofthe full calendar of events, activities and school news. No moreout-of-date paper calendars, searching through letters from theschool or browsing the website – everything you need to know, whenyou need it, at your fingertips! Key features of the currentversion: - View the school calendar and make it more relevant toyou by using the calendar filters and save them to your calendar -View the school news - Receive important messages How to Use theApp At the bottom of the screen there are five tabs: Home: See asummary of the latest news and today’s news. You can click on theevent it will take you to the full event details. The latest fivenews items can be scrolled through to view the headlines, you canclick on the headline to view the full news story. Calendar Thiscan be viewed in two ways; as Month To View or List View. You canswitch between these views using the icons in navigation bar at thetop of the page. On the centre left is a small calendar icon and onthe right is a small list icon. When using the Month To View andone of the dates is marked by a dot, this indicates that there isan event on that day. If you tap on that date, you will see theevent appear below the calendar. Tap any event to see more detailedinformation and a map of the event location (if applicable). In theList View, you can scroll through all this months events, in dateorder. Again, you can tap any event to see more detailedinformation and a map of the event location (if applicable). Youcan even import an event into your personal calendar from your app,if you select the import icon. Please note that if an event isaltered in this calendar it will not change the details in yourpersonal calendar unless you re-import the data. Messages Shows youall the messages for your school or organisation. Also within thissection you can assign yourself to personalised message groups,simply click on message groups to activate and deactivate whichmessages you would like to see. News Shows all the latest storiesfrom your school or organisation. If you tap on any news item youwill be able to see more detail. Information: In this tab you canview the schools documentation (if applicable) such as thereprospectus, news letters and links to further website links to moreinformation. You can also share the app via email and social mediaCalendar Filters: Clicking on calendar filters, this gives you theopportunity to only see those calendar items that are relevant toyou by selecting the Departments and Activities the app willdisplay. ---- SSA is for Android version 4.3 and above. Copyright ©Apps Central Ltd. All rights reserved. The design of this Androidapplication is fully protected by copyright and may not bereproduced without permission. If you have a child at Deans Community High School you can haveyour own personal view of the full calendar of events, activitiesand school news. No more out-of-date paper calendars, searchingthrough letters from the school or browsing the website –everything you need to know, when you need it, at your fingertips!Key features of the current version: - View the school calendar andmake it more relevant to you by using the calendar filters and savethem to your calendar - View the school news - Receive importantmessages How to Use the App At the bottom of the screen there arefive tabs: Home: See a summary of the latest news and today’s news.You can click on the event it will take you to the full eventdetails. The latest five news items can be scrolled through to viewthe headlines, you can click on the headline to view the full newsstory. Calendar This can be viewed in two ways; as Month To View orList View. You can switch between these views using the icons innavigation bar at the top of the page. On the centre left is asmall calendar icon and on the right is a small list icon. Whenusing the Month To View and one of the dates is marked by a dot,this indicates that there is an event on that day. If you tap onthat date, you will see the event appear below the calendar. Tapany event to see more detailed information and a map of the eventlocation (if applicable). In the List View, you can scroll throughall this months events, in date order. Again, you can tap any eventto see more detailed information and a map of the event location(if applicable). You can even import an event into your personalcalendar from your app, if you select the import icon. Please notethat if an event is altered in this calendar it will not change thedetails in your personal calendar unless you re-import the data.Messages Shows you all the messages for your school ororganisation. Also within this section you can assign yourself topersonalised message groups, simply click on message groups toactivate and deactivate which messages you would like to see. NewsShows all the latest stories from your school or organisation. Ifyou tap on any news item you will be able to see more detail.Information: In this tab you can view the schools documentation (ifapplicable) such as there prospectus, news letters and links tofurther website links to more information. You can also share theapp via email and social media Calendar Filters: Clicking oncalendar filters, this gives you the opportunity to only see thosecalendar items that are relevant to you by selecting theDepartments and Activities the app will display. ---- DeansCommunity High School is for Android version 4.3 and above.Copyright © Apps Central Ltd. All rights reserved. The design ofthis Android application is fully protected by copyright and maynot be reproduced without permission. If you have a child at Dunlop Primary School and ECC you can haveyour own personal view of the full calendar of events, activitiesand school news.No more out-of-date paper calendars, searchingthrough letters from the school or browsing the website –everything you need to know, when you need it, at your fingertips!Key features of the current version: - View the school calendar andmake it more relevant to you by using the calendar filters and savethem to your calendar- View the school news- Receive importantmessages How to Use the App At the bottom of the screen there arefive tabs:Home:See a summary of the latest news and today’s news.You can click on the event it will take you to the full eventdetails. The latest five news items can be scrolled through to viewthe headlines, you can click on the headline to view the full newsstory. Calendar This can be viewed in two ways; as Month To View orList View. You can switch between these views using the icons innavigation bar at the top of the page. On the centre left is asmall calendar icon and on the right is a small list icon.Whenusing the Month To View and one of the dates is marked by a dot,this indicates that there is an event on that day. If you tap onthat date, you will see the event appear below the calendar. Tapany event to see more detailed information and a map of the eventlocation (if applicable).In the List View, you can scroll throughall this months events, in date order. Again, you can tap any eventto see more detailed information and a map of the event location(if applicable).You can even import an event into your personalcalendar from your app, if you select the import icon. Please notethat if an event is altered in this calendar it will not change thedetails in your personal calendar unless you re-import thedata.MessagesShows you all the messages for your school ororganisation. Also within this section you can assign yourself topersonalised message groups, simply click on message groups toactivate and deactivate which messages you would like to see. NewsShows all the latest stories from your school or organisation. Ifyou tap on any news item you will be able to see moredetail.Information:In this tab you can view the schoolsdocumentation (if applicable) such as there prospectus, newsletters and links to further website links to more information. Youcan also share the app via email and social mediaCalendarFilters:Clicking on calendar filters, this gives you theopportunity to only see those calendar items that are relevant toyou by selecting the Departments and Activities the app willdisplay.----Dunlop Primary School and ECC is for Android version4.3 and above.Copyright © Apps Central Ltd. All rights reserved.The design of this Android application is fully protected bycopyright and may not be reproduced without permission.